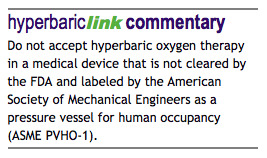 Plenty of homework has gone into our new FDA Clearance and UHMS Approval page, which nicely covers the basics of medical device regulation and safety in hyperbaric oxygen therapy today. Many readers familiar with HBOT may also learn for the first time how "approved" diseases and conditions got approved and what "off-label" treatment really means. We could find nothing like this information all in one place on any other website. So we looked to primary sources and pieced the story together ourselves. It's the kind of easy-to-read, carefully researched, and original content you will find on HyperbaricLink and nowhere else in the hyperbaric community. And it's the centerpiece of our new campaign to assure our visitors the information we provide is trustworthy. Whether you're here to learn more about HBOT, research your disease or condition, or find a treatment center, we'll provide helpful facts and links all along the way. All our best for your good health.